Ecommerce Europe, the association of European online retailers, reports the Western European b2c online commerce economy to have reached €160.8 billion in 2012, marking a 16% growth from 2011.The Dutch ecommerce market value was assessed at €4.6 billion, marking less than 9% growth from 2011. 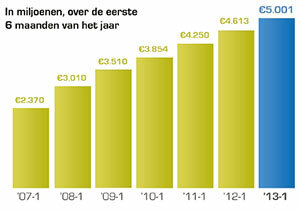 As such, the Dutch online retail economy was considered to be the slowest one in Western Europe last year. In Q1 2013, the Netherlands has demonstrated an 8% increase in online sales, with the turnover growing to $5 billion (Source: eCommerce News). The number of individual orders placed across different online commerce outlets has increased by 10% and totaled 46 million (Source: eCommerce Facts). On the other hand, in its Ecommerce Readiness Report 2013 market analyst company Forrester has ranked the Netherlands #7 in its List of Top 10 Countries with the potential to become world’s strongest ecommerce economies. To determine ecommerce growth potential, Forrester analyzed such factors as the number of debit / credit cards per capita, retail market intensity and activity, population’s digital literacy and tech savviness, and others (Source: Brainsins). 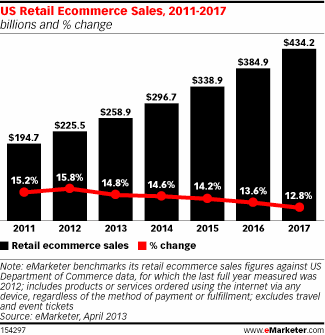 The global ecommerce market is estimated to total $631.7 billion in 2013 marking a compound annual growth rate of almost 19% between 2008 and 2013. The United States alone accounts for almost half of the global online retail market with its $259 billion e-tailing sector size (up 15% from 2012, see picture below). With the mobile commerce catching up and accounting for 15% of all online retail sales (and expected to earn $39 billion in 2013), ecommerce obviously continues gaining momentum and steadily becomes a niche that every single company, regardless of its size and industry, tends to fill in. And today’s global ecommerce software market totaling $3 billion proves it. Do you need more arguments why ecommerce development is a backbone of your business success and boosted sales? Readability is often thought as the most important aspect of web usability. Effective readability can boost your conversion, attract more new visitors and retain old. It is easier to read the text if the test and the background colours are in contrast. Avoid such colour combinations as blue on red, yellow on white or grey on black. 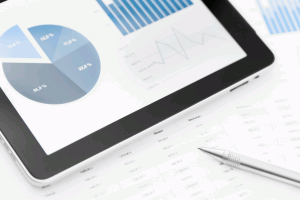 Analysts from Juniper Research predict that purchases on tablets will beat out smartphones over the next three years. According to Google study they did of over 1400 tablet users, 28% now use their tablet as their primary PC and 42% of them are shopping via their tablet. Pixelated and fuzzy site images. Problem: Having a single source attribute, IMGs can’t provide a user with one image optimized for different display resolutions and sizes. Goal: Find a solution that will send the image of the most relevant size and resolution depending on the browser and screen resolution of your device. Solution: Responsive IMGs that are delivered using the HTML IMG tag that come from different sources depending on the screen size.